Ok so I’ll admit it. I don’t go to church. I was raised Catholic and have nothing against organized religion, but it’s really just not me. I can’t sit still long enough to really get what’s going on. I don’t mean to, but I tune out and lose focus every time I try and go. It’s ok though, God knows that I feel a calling to do something different. A call to help people I may never even meet and who many never know that I reached out and helped them. I can’t tell you why this appeals to me. Maybe it’s because I’m secretly an introvert. Now, NONE of my friends will tell you that I’m shy or that I’m quiet. I am far from it, but I promise you I really do love being alone with my own thoughts and ideas. Some people I used to work with would call me “the idea machine” – my mind literally never turns off and is always going a mile a minute. I can’t slow it down, no matter how hard I try it is just constantly in motion. Idea, after thought, idea, after thought. Write a book, start a class, don’t forget to email so-and-so, I should blog more, I should make spaghetti tomorrow, did I schedule that package pickup? You get the idea… haha! But the one idea that kept popping up in my mind over and over again was giving back and finding my purpose. I was inspired by companies like TOMS and FEED who gave back with their products. I knew this was what I had to do. My purpose not just to support my family, not just to be a good mom, wife, daughter, sister, and friend, but to reach out to those who needed help. After that night the ideas flowed faster and my call to action was right in my face, so I decided to answer it, and Hello World Paper Co. was born. When I first started I gave to various charities that my brides supported on their big day. I’ve given to over 35 different charities and counting with over $5000 donated since I started the shop. 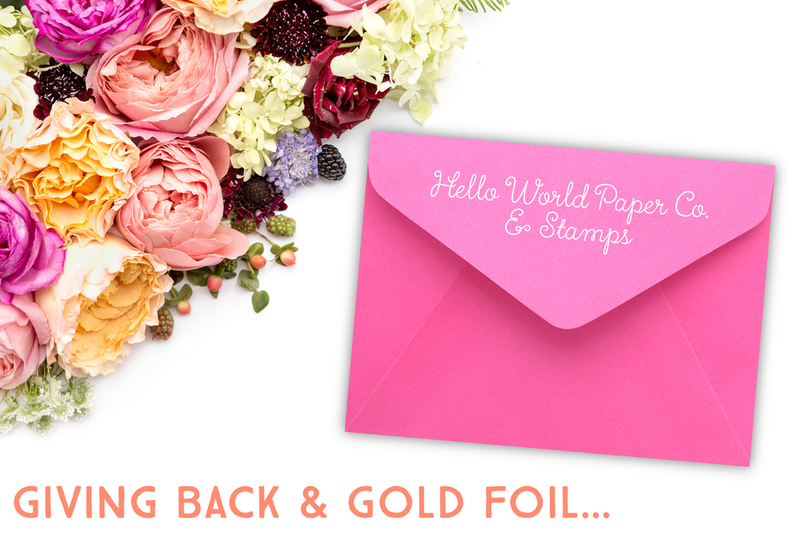 Now, with Hello World Stamps joining Hello World Paper Co. we still give to charities chosen by our brides, but we also select a special charity every month to receive 10% of all shop profits. In January, my birthday month, I always give to The Crohn’s and Colitis Foundation to help others who are fighting this horrific disease. This past February Hello World supported The Haiti Mission Team. The Haiti Mission Team works year round planning and fundraising to help provide the children of Haiti with a yearly feeding program, clothing, shoes, school supplies, and personal care items such as shampoo, toothbrushes, toothpaste, and children’s vitamins. The team also provides a few toys that have been donated for the children. You can find out more about them and inspiring work they do in Haiti here: The Haiti Mission Team on Facebook My good friend, Ari, is on the team. Here she is with some of the children. They know her by name since they go to same places every year and they just love her. So, why do I give back? This guy. Right here. His face is the only reason I need. (Oh, and it feels really good to help someone else!) How cute is he though?? AAHH! If you want to help the Haiti Mission Team you can purchase the “Let Your Light Shine” print in either of my shops, Hello World Paper Co. or Hello World Stamps or online at www.helloworldpaperco.com. 100% of the proceeds from this beautiful gold foil print will go to helping the children in Haiti. Ok so now for March! Can you tell that I’m playing catch up?? lol! I told you! Idea machine, but no time to do it all! I really did mean to blog about each charity at the beginning of each month, but I was hyper focused on the idea and not implementation – my downfall. :) Well, no more! I am going to be rigorous about blogging about these wonderful organizations every month! So here you go! When giving back every little bit helps. Wheather it is your time, money, or prayer. No amount is too small. How do you give back to others in your life? What gives you purpose? OH! I’m also looking for some charitable organizations to support too! Know one? Run one? Email me at helloworldpaperco@gmail.com – I would love to hear about your cause!